*Actual On Road Price of TVS Victor at the dealership may vary. We ride the new 2016 TVS Victor at the TVS Motor Company's test track at its Hosur plant premises. What's the new Victor like and how does it ride? Here are our impressions. Born in 2001, TVS’ Victor was a renowned name in the commuter segment back then. Attributed by promising economy, superior ride quality and great ergonomics Victor soon became a household name garnering a fair number of sales every month. While basking in glory, Victor got fenced in by emerging competition which led to a steep fall in demand. Unable to recoup its position, TVS thought to call it a day for the once popular model. Years after Victor’s termination from commuter segment, TVS has resurrected the brand to start afresh. To ensure Victor’s success, TVS did a lot of homework before giving it a final shape, hence the new version is not just a reworked avatar of the previous model but it features aplenty new elements that are quite visible. Engine powering the commuter bike is a new unit and it is notably the most prominent change over the model it precedes. Pricing is spot on positioning the 110cc bike aggressively amid fierce competition. The well-proportioned muscular contours reflect TVS’ contemporary approach for the reincarnated model. Styling has been done tastefully which complements the chiselled silhouette. Sharp lines are present all across the length of the body and graphics further accentuate the premium look. Cockpit gets a part-analog speedometer but it isn’t all digital. Instrument panel on the whole is not complicated and offers great visibility. The long and wide single piece seat offers enough room for rider as well as pillion. Power is drawn by a 110cc, single cylinder, air-cooled engine borrowed from TVS’ Ecothrust engine family. The engine is good for 9.46bhp at 7500rpm along with 9.4Nm of torque at 6000rpm. Moreover, the engine features a combustion chamber oil cooling jacket which improves the performance, lessens the NVH levels and heightens the throttle response. Among the various features aboard, a switch gear, hazard lights, digital tripmeter, digital odometer, exhaust muffler, a single piece seat, a large clear lens head light, grab rail, hexagonal tail lamp and clear lens indicators are included. The new engine pulls off impressive performance managing to achieve a top speed mark of 94 kmph. 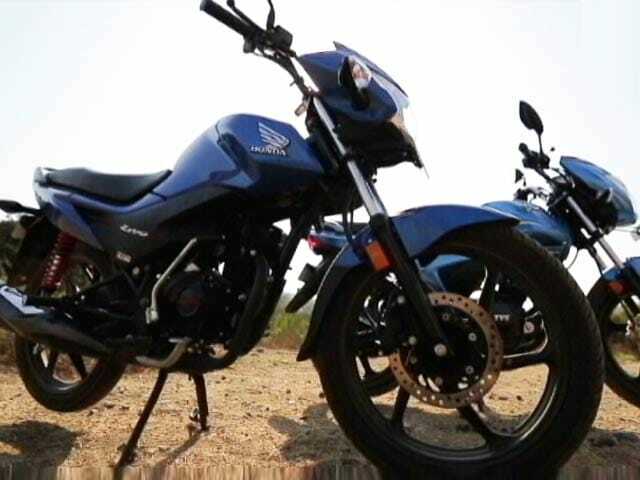 As for the performance, the engine runs smoothly without showing any signs of strain between 70 kmph to 80 kmph. Mileage delivered is impressive making it a frugal option in the commuter segment. Stopping power is delivered by 240mm petal disc brakes in front and 110mm drum brakes at rear. Ride quality is not exceptional but it is comfortable even on erratic surface. Handling is fairly good on the sharp corners. The Remora tyres offer good grip even on the wet surface all thanks to the reduced rolling resistance. The all new TVS Victor 110 will rival the likes of Honda Livo, Hero Passion Pro and Mahindra Centura in the highly competitive 110cc commuter segment. The new TVS Victor Premium Edition gets an upmarket touch on the motorcycle, adding new chrome detailing, premium sticker scheme and a chrome crash guard to the motorcycle. TVS Motor Company can now be certain that the 'Victor' nameplate never lost its charm as the commuter motorcycle has hit a milestone of one lakh unit sales in nine months. I purchased tvs Victor on oct 2016, I was facing milage problem from my 2nd service.. till date I didn't get proper reply and solution from the dealer. My bike is giving 45 to 47km/L but their advertisement says 76kms/L. I feel very bad.. I'm not happy with the vehicle the fork oils are leaking it has done only the above mentioned KM's I'm not getting the mileage which is committed by TVS.Past 3days I'm behind the dealer for service.the vehicle is not stable after it cross 60kms speed on ECR.